Do you crochet? Or do you want to learn how to crochet? 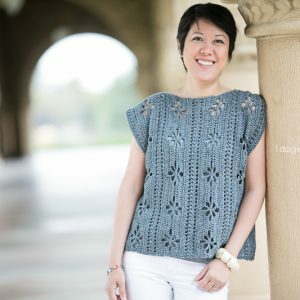 Well, stay tuned because in a few short weeks, I’ll be having my very first Crochet-Along right here on this little ol’ blog! We’ll be choosing a project to work on together and going through the pattern with lots of pictures and lessons on the basics. I’ve also teamed up with a few of my favorite crocheting friends to help answer any questions you may have, and offer some awesome prizes to those who participate. Excited yet? The crochet along will start at the beginning of February, so keep in touch and you won’t miss the fun! Now onto the pattern! 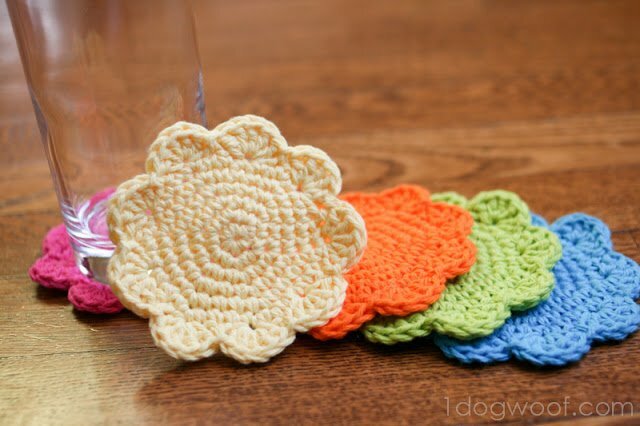 These little flower coasters are perfect under a pint glass (with beer? rootbeer?) or under a mug, perhaps matched up with a mug cozy for a quick gift. Or switch it up, and use it as a facial scrubber. By the way, this will be one of the patterns up for the Crochet-Along pattern vote, so take a look and enjoy! I’m pretty new to writing patterns, so let me know if there’s anything that is difficult to understand. If you’d like to sell items from this pattern or share it with your friends, I just ask that you give credit back to One Dog Woof. Please do not repost or re-distribute the pattern in its entirety. Thanks! Mark the end of each round with the stitch marker, since the pattern is worked in a continuous spiral. Round 1: Start with a magic ring. Work 6 sc into the ring. Round 7: Skip 1 sc. *sl st in next sc. skip 1 sc. 5 dc in next sc. skip 1 sc* around. Join with a sl st to the last stitch of previous round. Fasten off and weave in ends. These are so cute! Will definitely have to try. And looking forward to seeing more about the crochet-along! This IS really cute and really fun to make. I’m going to make a bunch. Thanks for the pattern. what a lovely pattern, thanks so much for sharing! I learned how to crochet right before Christmas, so I’m still a newbie and looking forward to the Crochet-Along!! I think this pattern would be awesome as face scrubbies, like you mentioned, and I plan on doing just that as soon as I find cotton yarn. Yay! I have been wishing for this! I know I don’t have any hooks! Looking forward to it! Thank you! Thank you Tracy! I’d love it if you could spread the word and have others come join the fun! Found you from Craftgawker. You’ve got some great projects! I am a new follower on GFC. Thanks! These are lovely – I really like the colours you used. Sorry if I’m being a bit stupid – is this pattern in UK or US terms? I’m new to this crochet malarkey! So cute! I pinned it! Cute coasters! I came over from The Gunny Sack. You have a beautiful blog. 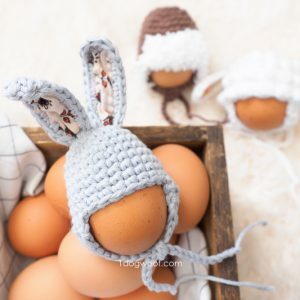 These are adorable, and I love a quick crochet project, thanks for sharing! Oh, I’m so glad to see you back at Hookin On Hump Day! I love your work and your photos – gorgeous! Thanks for sharing at Hookin On Hump Day! So lovely!!! Thanks so much for sharing the pattern! Would love to have you visit me sometime. Love these! I made coasters with some leftover yarn but they aren’t as cute as these!! Found you over @ Southern Lovely. I love these! Thanks for sharing this wonderful FREE crochet pattern! These are adorable–thank you for sharing the pattern! These are just gorgeous!! Thank you for the pattern! I love to crochet! I am hosting a new Pinterest Power Pin party and would love to have you share these if you have a chance!! I don’t know how to crochet but these are so beautiful ! These are adorable – just pinned! Thanks so much for sharing at Mom On Timeout! This amazingness will be featured today on Smart School House for Whimsy Wednesday! You are awesome! Can’t wait to see what you’re brining to the party today. These are super cute. I’ll be pinning this. I enjoyed my visit today & if you would ever like to link up I have a weekly link party @ DearCreatives.com come join in sometime or just visit. 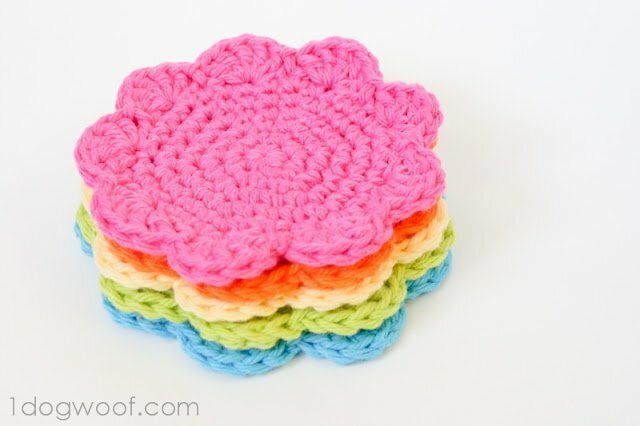 cute flower coaster pattern, thanks for sharing and your photo is beautiful! Hi, I pinned this after finding it on pinterest already. I pinned from your blog though. I like the coasters a lot! How can I make these flower coaster leaving a hole in middle of each to put on a wooden dowel spindle? THANKS ahead to anyone that can help. I’m rather new to crocheting. Eva, The pattern says to start with a magic circle, which closes up the center. 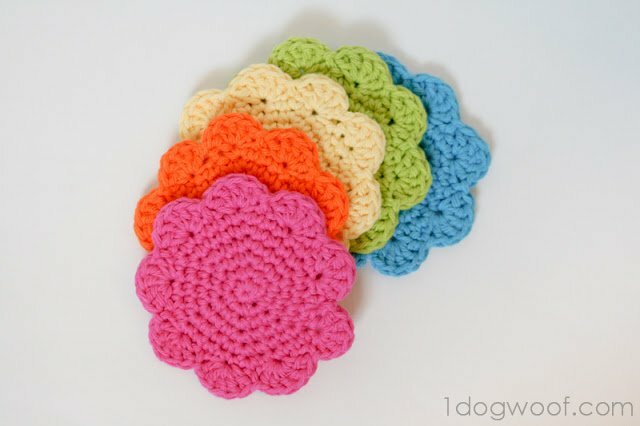 If you want to leave the center open, you can start your round using the Chain 2 method I show in this post: http://www.1dogwoof.com/2013/08/crochet-in-the-round-magic-circle-and-chain-2.html This method leaves a hole, but it’s small, you’ll need a small dowel or crochet a little more loosely at the beginning to ensure the hole is big enough for your dowel. Hope that helps! These will be good for tea parties, gifts and in the Spring and Summer..these are easy to make..
what is “a magic ring” that you mentioned in the flower coasters pattern? Penny, the magic ring method is a way to start crocheting in the round. You can see more at this post: http://www.1dogwoof.com/2013/08/crochet-in-the-round-magic-circle-and-chain-2.html. It’s just one method, so there’s other ways to start with a circle. The magic ring method allows you to pull the tail to close up the hole in the center that you would otherwise get. I have really wanted to learn how to make these flowers. Is it harder to make them smaller? Can’t wait for your crochet lessons. Thanks. Cheryl, to make them smaller, you’d have to use a smaller hook and thinner yarn, I think. And as the project gets smaller, it just gets harder to see the stitches! I’d like to make these but how do I print off the pattern. You can print from your browser window. I do not have a print-friendly copy of the pattern, sorry! I can’t say without seeing it, but you can count your stitches after every round and see if that helps. I do that a lot when I think I’m doing something wrong but can’t figure it out. Plus, then I don’t have to rip out the whole project if I check every little step along the way. These are adorable! I have a general question, though… Every time I try to make a coaster or doily, the coaster curls and the doily ends up with waves. Can you please tell me what I’m doing wrong? Thank you for the pattern. Personnally I will turn it into a scrubber made with tulle. I’ve made two of these and they look very nice but I am wondering why I end up with ten petals instead of nine. I am counting my stitches after each round. I just love these little flowers. Can they be made larger – to the size of an lap warmer? If so, how? Thanks! And turning them into award ribbons is a great idea! I just made this pattern with a thinner yarn and I am going to use it as a pendant for a necklace. I am new to crochet and this pattern was not only fun to make but easy to follow. Clear instructions ! Beautifully clear and well written. You did a great job of writing this pattern. I usually have to edit patterns before I print them out (Such as reducing “First, you are going to want to take your size H crochet hook and work 9 chain stitches” to “Ch 9.”). I didn’t need to edit yours. I like your style, and I am definitely going to make a bunch of these coasters for my daughter’s house in the next couple of weeks. Thank you for posting this pattern.